We've all dreamed about it: Winning the lottery without even playing. Inheriting millions from a wealthy, great-uncle you never knew existed. Pitching the perfect business idea to the perfect person at just the right time. But chasing quick riches and instant wealth is an exercise in futility. It's like trying to capture a purple unicorn that lives outside of the castle just beyond the end of the rainbow; it's impossible. It doesn't exist. Movies, books, and social media have sold the idea that getting rich quick is possible. But that is a lie. The allure of fast, easy money is a mirage that can lure you down a dark path. You risk emotional and financial devastation, as well as wasted energy and resources. And yet, people can't seem to let go of searching for ways to skip work and go straight to the wealth. It is impossible — always has been, and always will be. Here's why. The human mind, body, and soul is built for efficiency. Think about what happens when you decide to start exercising. At first, your movements are awkward. You lack coordination and you wear yourself out quickly. But a funny thing happens over time — you adapt. You not only get better at performing the exercises, but your body also adjusts and finds ways to perform the movements more efficiently in order to conserve energy. The same thing is true when it comes to building wealth. It is natural to look for ways to get as far as you can with as little effort as possible, but there will always be a limit. Working out physically allows your body to adapt by building muscle memory, strength, and endurance. Similarly, as you build wealth, you develop patience, mental strength, and the stamina you need to sustain your money over time. And just like with exercise, getting rich is generally an equitable endeavor — at least initially. You only get out what you put in. The bottom line is obtaining wealth — or anything of value — is usually attached to hard work, patience, and growth over time. Wealth without work is similar to using crash diets to lose weight. The results are not sustainable and you haven't learned how to properly maintain the changes. You need to consistently work hard and see your progress increase over time. There are countless stories of people who come into a tremendous amount of money only to find themselves back where they started shortly thereafter. According to the National Endowment for Financial Education, 70 percent of people who win the lottery or get a big windfall all at once go broke within a few years. Getting money and keeping it are two entirely different things. When you get something quick — without having to work and sweat for it — you don't value it as much. And what you don't value, you won't protect. One of the biggest problems financial advisers deal with when people get a sudden windfall is that they give too much away to family and friends. And they fail to properly keep track of what they get. When you get money quickly but haven't learned how to properly manage the little you had before, you simply repeat the same cycles but on a much larger scale. Get rich quick schemes are never advertised as such. They are shrouded in mystery and secrecy. And who doesn't love a good secret? Especially one that can make you rich and elevate you above the rest of us mere mortals? Most get rich quick schemes play on your desire for lopsided outcomes. Again, looking for a way to maximize impact and to gain ground quickly is completely natural and strategic. It doesn't make you a bad person. But it can make you a target. The best approach to take when it comes to investment pitches and business propositions is to keep it simple. You are not a financial expert nor a business mogul. Don't pretend to be one. If you don't know, you don't know. Not knowing or understanding an investment or proposal is a key indicator that you need to back away from the table. 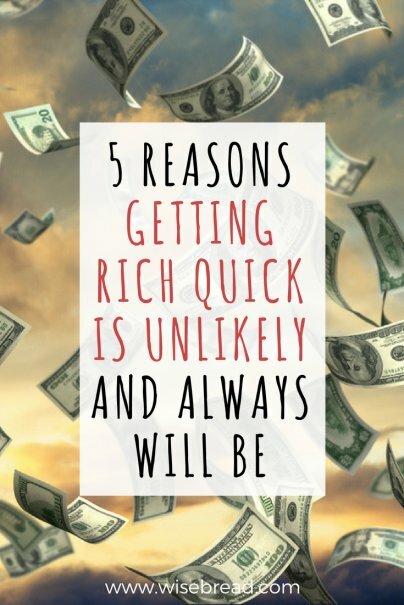 Luck has very little to do with becoming wealthy. The ability to recognize and capitalize on a good opportunity is not happenstance. It takes wisdom to build and keep wealth. And building wealth slowly and experiencing the highs and lows of money management is what helps you gain wisdom. One of the top reasons that getting rich quick isn't possible is because the concept itself is misguided. What is rich? When is enough, enough? And how do you know you are actually rich? Are you "oficially" rich when you reach millionaire status? Are you rich when you can buy whatever your heart desires? There are famous athletes, actors and actresses, singers, doctors, lawyers, scientist, etc. that make hundreds of thousands of dollars — millions even — but still are broke.